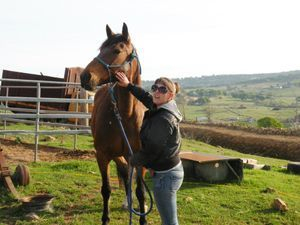 16 yr Standardbred Mare "Libby"
Libby is 15.3hh very healthy, easy keeper. Great ground manners, great under saddle, no spook, buck, rear, etc. Anyone can ride but would like to see her go to a confident rider where she can go out on lots of trails. Shes not really an arena horse. Shes really an awesome mare I just feel shes going to waste as I dont have access to trails. Im asking $3500 but the right home is more important than anything. UTD on everything.